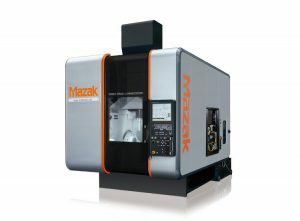 The HYPER VARIAXIS Series of multiple-surface, 5-axis Vertical Machining Centers delivers Mazak’s highly productive Done-In-One manufacturing with the capability to completely machine workpiece tops, sides and angled surfaces in single setups. 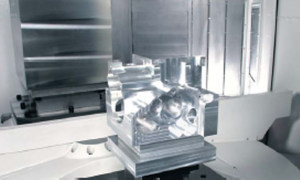 The machines incorporate the most advanced technology available to provide unparalleled performance. 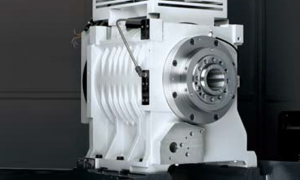 Linear motors drive machine linear axes for blinding fast rapid traverse speeds and exact positioning, while direct drive motors power machine tilt/rotary trunion tables for high precision 5-axis contouring. 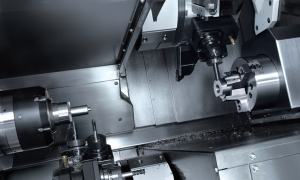 The machines also come standard with powerful high-speed spindles and ample tool storage. For ease of use and operator convenience, the machine designs incorporate large front doors for total work area access – from both the fronts and tops of machines. Control panels include bigger screens and more intuitive interfaces, and all machine contours are rounded to prevent operator injury.